Research from Nancy Pandhi, MD, MPH, PhD, is part of a toolkit that helps healthcare organizations better engage patients. 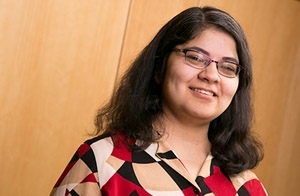 Research from the UW Department of Family Medicine’s (DFM) Nancy Pandhi, MD, MPH, PhD, has been incorporated into a new toolkit to improve patient engagement in health-care delivery. The toolkit, “Patient Engagement in Redesigning Care,” provides health-care managers, clinicians and researchers a clear, detailed, step-by-step plan to develop patient engagement as a meaningful and helpful component of safety and quality improvement. It is available as a free download through the University of Wisconsin’s Health Innovation Program. Dr. Pandhi led research to evaluate the efficacy of the patient engagement program that was the basis for the toolkit. Her team found that program participants learned how to engage patients, gained confidence in patient engagement tasks, and believed in the value patients bring to quality improvement. They also found that participants used patient input to change processes, communications, and physical layouts within the clinic setting. For example, one team talked with parents of children who were due for immunization about the timing of when the immunizations were given during the office visit. They found that parents preferred the total visit time to be as short as possible and did not mind if immunizations were given before the patient saw his or her primary care physician. So, the office protocol was changed to allow this to happen. The toolkit helps fill an important gap for health care organizations seeking to improve health care delivery. That’s because although patient engagement is becoming more and more embedded in health care policy—and driven by market pressures—knowing how to take full advantage of patients’ contributions may not be intuitive. “Patient experience has been correlated with several important health outcomes such as adherence, disease control and hospital admissions. It makes sense that in order to improve the patient experience we should be engaging patients themselves when redesigning care,” Dr. Pandhi explained. For more information about the UW Health primary care redesign initiative upon which the toolkit was based, read “Engaging Patients at the Front Lines of Primary Care Redesign: Operational Lessons for an Effective Program,” published in the December 2014 Joint Commission Journal on Quality and Patient Safety.